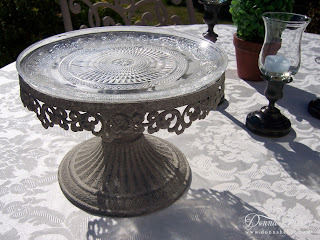 Today I am joining Susan at Between Naps on the Porch for Tablescape Thursday and Marty from A Stroll Thru Life for Table Top Tuesday. Thank you to our wonderful hostesses. 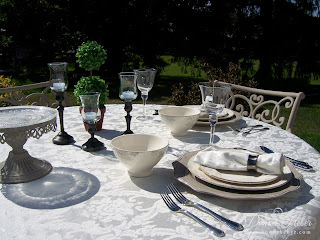 On this gorgeous summer day my favorite spot for tablescaping and dining is outside on the patio. There's just something special about alfresco dining in the open air, be it during the day with the sun warming your back or at night with the moon and stars overhead. I have set a casual dinner for my husband and I. Can you hear the Classical music playing in the background? 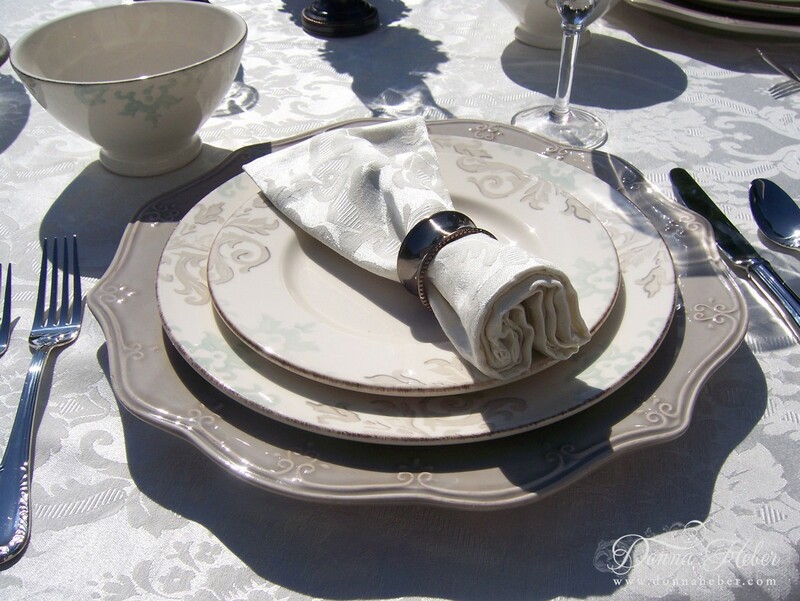 This “Corrine” dinnerware is from Neiman Marcus and is made in Portugal. It has a delightful damask pattern in light blue and taupe. 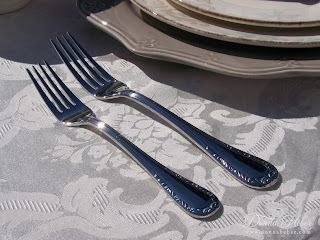 The simple beading of these oil-rubbed bronze napkin rings adds an elegance to our alfresco dining. Taupe colored chargers compliment this pattern with soft scalloped edges. Flatware is Lenox in the “Venetian Lace” pattern with a subtle scroll motif. Later we will have dessert served on our cake plate. 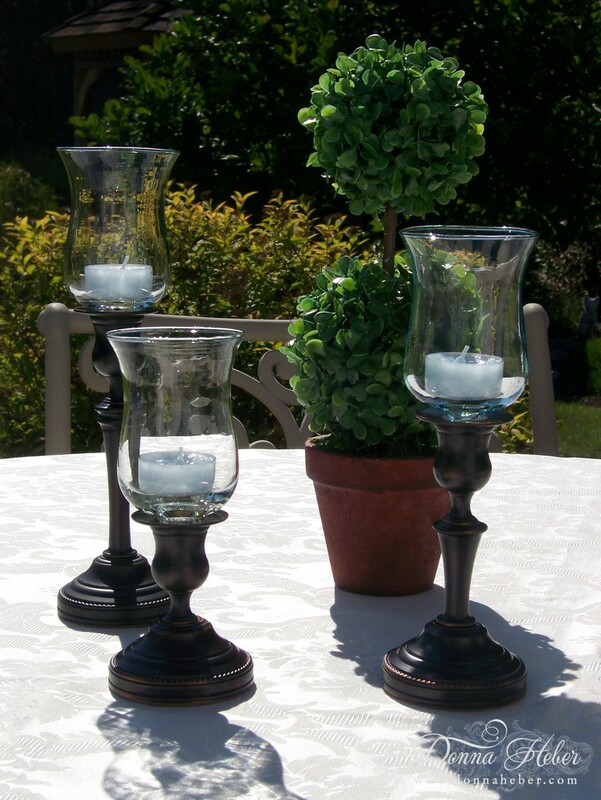 These Smithsonian Collection Brighton Candlesticks with glass votives can be used as either a candlestick or votive. The oil-rubbed bronze pieces are modeled after 19th century originals. Unfortunately, all of these pieces have been retired by Baldwin. I decided at the last minute to add this pretty topiary. 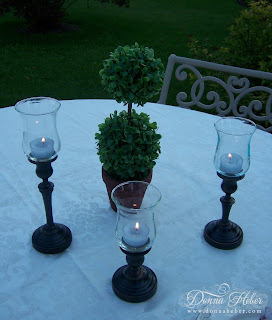 Did you know topiary is an old art form that first surfaced in ancient Egypt and classical Rome? So what is for dinner this evening? Well, I have surprised my husband with a delicious Italian dinner. 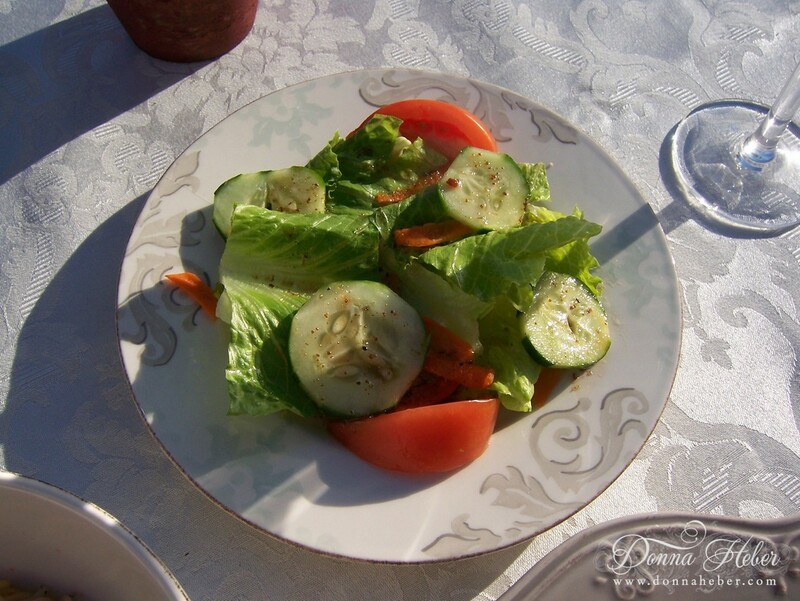 A fresh garden salad with a balsamic vinaigrette dressing to start. 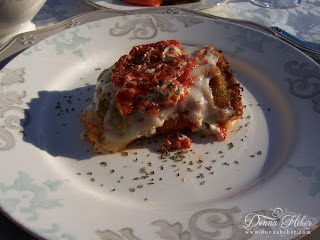 Eggplant Rollatini (sauteed eggplant, rolled and filled with ricotta and Italian cheeses). Angel hair pasta to compliment. 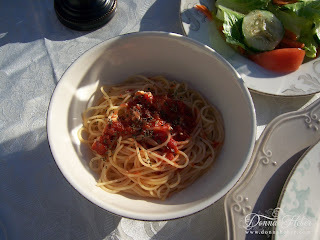 We both love angel hair! As the sun goes down, I bring out a piece of cheesecake with strawberries for my husband. It is so warm today the whip topping is melting! Enjoying the evening by candlelight and listening to music. 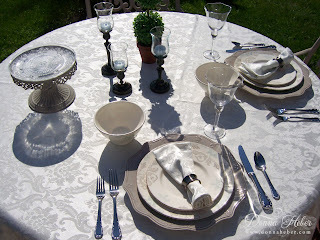 Thank you for viewing my outdoor patio tablescape. I would love to invite you, but this is a romantic dinner for two! Lovely dinner and it looks really good too. Gorgeous table and the food looks wonderful too! 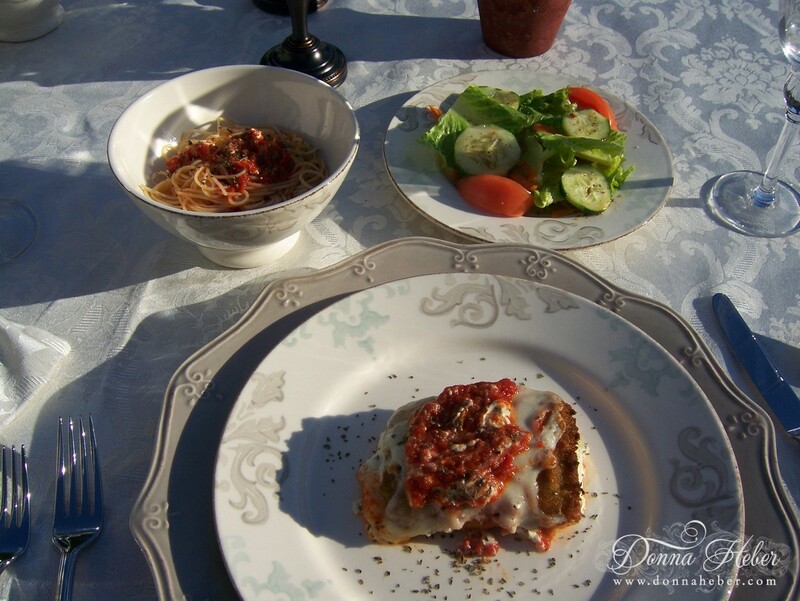 gorgeous pictures from your dinner table donna. your dinnerware looks fabulous also your candle's. I see that it's a romantic dinner and 3 would be company. Darn, the dinner looks so appetizing, maybe next time? Lovely Donna! The food sounds and looks wonderful! Your dishes are so pretty and I love the taupe chargers! Very pretty and romantic! Beautiful table! And the food looks just scrumptious! 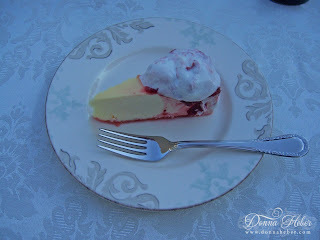 Its funny I have the same cake stand plate from Istanbul. 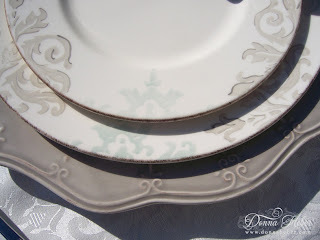 I am SO in love with those damask dishes!!! They are gorgeous!!!!!! Beautiful setting! I hope you and your husband had a grand time! What a wonderful setting and the food looks delicious. I also LOVE that cake stand. What a romantic summer evening. Very romantic and elegant. I hope you and your husband had a wonderful time just enjoying each others company in the candlelight. That's so pretty. The colors of the food really pop on those neutral dishes! I love that cake plate!!! Please tell me where I can get it... does it come with a cover?